Severe Heat in Mumbai ! 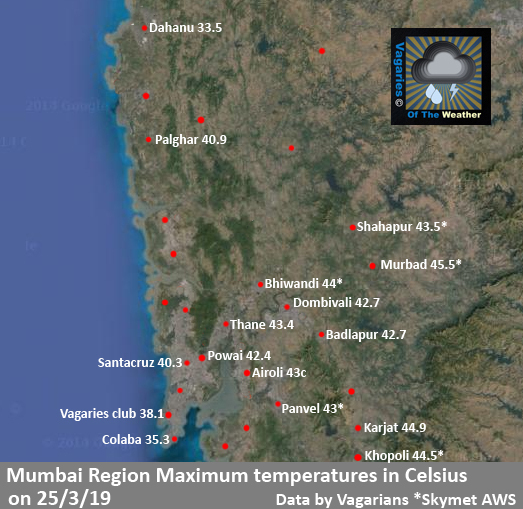 Mumbai Scruz touched 40.3c, above normal by 7c, qualifying as a "Heat Wave"
Low Humidity was observed in Scruz, with Hygrometer showing between 13%-15% as the driest period...Unusual for this coastal metropolis. The severe temps expected to remain around 38/39c at Scruz on Tuesday, and then some relief as the day temperatures fall to around 34c from Wednesday...Convective clouding expected on Wednesday/Thursday. Some convective thunder showers expected in South Madhya Maharashtra on Tuesday and Wednesday (Kolhapur/Solapur/Sangli/Satara/Miraj), and in N.I. Karnataka. 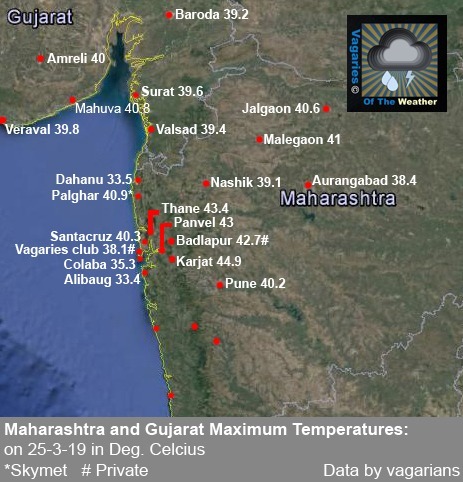 Why temperatures in palghar and Dahanu are so contrasting? Dahanu's observatory near to sea so max comes lesser than Palghar ! In winter same Dahanu's min is also higher around 14-15c, while Palghar min drops to single digit at 8-9c also !! Palghar town is 7km inlamd from sea ! Kapde Budruk Mahavedh aws max 46.9℃ which is highest max today in the Maharashtra near Poladpur. Pune is also facing 40+ , is really a bad news. But sir Mumbai also coastal still very high temperatures.